For its massive information war waged against the Euromaidan protests and the consequent revolution that has toppled the authoritarian regime of pro-Russian Viktor Yanukovych, the Kremlin presumably mobilised all its lobbying networks in the West. This revealed what experts have long suspected, namely that today’s European extreme right parties and organisations are the most ardent supporters of Putin’s political agenda. Crimea, 16 March. Here they are: international ‘observers’ at the illegal and illegitimate ‘referendum’ held in the Autonomous Republic of Crimea occupied by the Russian ‘little green men.’ The overwhelming majority of the ‘observers’ are representatives of a broad spectrum of European extreme-right parties and organisations: Austria’s Freiheitliche Partei (FPÖ) and Bündnis Zukunft, Belgian Vlaams Belang and Parti Communautaire National-Européen, Bulgarian Ataka, French Front National, Hungarian Jobbik, Italian Lega Nord and Fiamma Tricolore, Polish Samoobrona, Serbian ‘Dveri’ movement, Spanish Plataforma per Catalunya. They were invited to legitimise the ‘referendum’ by the Eurasian Observatory for Democracy & Elections (EODE) – a smart name for an ‘international NGO’ founded and headed by Belgian neo-Nazi Luc Michel, a loyal follower of Belgian convicted war-time collaborationist and neo-Nazi Jean-François Thiriart. Presented by Michel as ‘a non-aligned NGO’, the EODE does not conceal its anti-Westernism and loyalty to Putin, and is always there to put a stamp of ‘legitimacy’ on all illegitimate political developments, whether in Crimea, Transnistria, South Ossetia or Abkhazia. Moscow’s money talks. Yet the EODE is only a drop in the ocean of extensive co-operation between the Kremlin and the European far right. 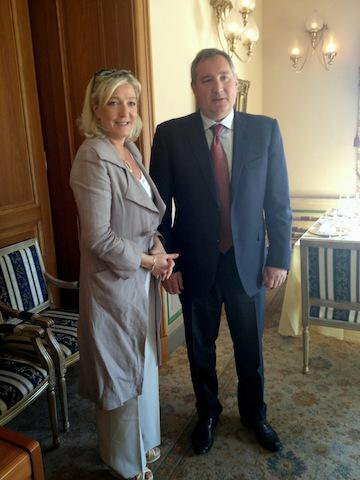 Front National’s Marine Le Pen now visits Moscow on a seemingly regular basis: in August 2013 and April 2014 she had meetings with Vice Prime Minister Dmitry Rogozin and Speaker of the Russian parliament Sergey Naryshkin. Le Pen’s adviser on geopolitical matters Aymeric Chauprade participated, as an ‘expert’, in the meeting of the Committee for Family, Women and Children Issues in the Russian parliament to endorse the laws banning adoption of Russian orphan children by LGBT couples. Several former members of the Front National run ProRussia.TV, an extension of the Kremlin’s international PR instruments such as Russia Today and the Voice of Russia. The Paris-based, Russian Institute of Democracy and Co-operation (yet another smart name) co-organised a conference in Leipzig on ‘family issues’, featuring speakers such as Thilo Sarrazin who is known for his attacks on multiculturalism, Jürgen Elsässer, chief editor of the far-right Compact magazine, and Frauke Petry, a spokesperson of the Eurosceptic party Alternative für Deutschland. 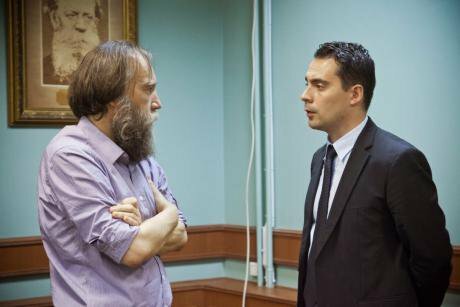 Jobbik’s leader Gábor Vona gave a lecture at Moscow State University at the invitation of Russian right-wing extremist Aleksandr Dugin; according to Vona, it would be better for Hungary to leave the EU and join the Russia-dominated Eurasian Union. Dugin himself gave a talk in the United Kingdom at the invitation of the far-right Traditional Britain Group and wrote a letter of support to Nikolaos Michaloliakos, the now jailed leader of the Greek neo-Nazi Golden Dawn, whose political programme urges Greek society to turn away from ‘American Zionists’ and ‘Western usury’ towards Russia. 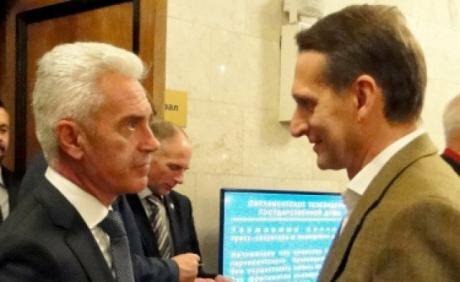 Just a few days ago, Bulgarian Ataka’s leader Volen Siderov launched his party’s European election campaign in Moscow. The list of the instances of the Kremlin’s co-operation with the European far right could be continued, but it seems more important to discuss the underlying motifs of this co-operation as well as the dangers that this co-operation poses to European democracy. First of all, the European extreme right parties and organisations respect the Kremlin for its might and vigour. In his manifesto, the notorious Norwegian mass murderer and terrorist Anders Breivik called Putin ‘a fair and resolute leader worthy of respect’. 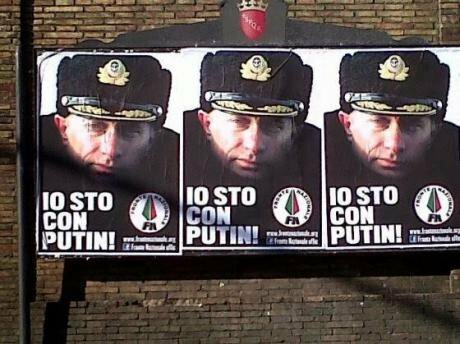 Italian far-right Forza Nuova salutes Putin’s Russia as ‘a new beacon of civilisation, identity and courage for other European peoples.’ FPÖ’s Andreas Mölzer hails Putin as a hero who ‘has managed to steer the post-Communist, crisis-ridden Russia into calmer waters.’ For the European extreme right, Putin is a powerful leader, who has challenged the political status quo of the West and has questioned the global role of the US, which the European extreme right openly loathe. The allegedly anti-globalist agenda of the Kremlin – which, in reality, is a concealed attempt at seizing and securing the position of the global superpower for Russia itself – attracts the European far left too, especially in Germany, France, Greece, Portugal and the Czech Republic. European neutrality, which verges on national isolationism as the logical consequence of self-determination driven to extremity, is also a popular idea among the European extreme right. It serves as a euphemistic argument in favour of ‘Fortress Europe’ and justifies non-interference in international matters outside Europe. Moscow’s smart trick that prevented the US military from crushing Bashar al-Assad’s murderous regime was celebrated across the broad extreme right spectrum. Preventing the West from stopping the most brutal regimes is presented as promoting multipolarity, but this multipolarity is a sham: its only aim is to undermine democracy globally. In Putin’s Russia, European right-wing extremists see a force that can indeed hamper the world’s democratic development. Less global democracy means less global security, and weakened global security may be interpreted as an excuse for enforcing the anti-immigration agenda. Russia’s authoritarian conservatism is yet another source of attraction for the European extreme right that consider Russia a country where ‘traditional’, ‘family’ and ‘Christian values’ have triumphed. For Jobbik’s Vona, Russia is ‘a better Europe’ because it ‘preserves its traditions and does not follow the culture of money and the masses’. Russia’s anti-gay laws, in particular, were a hit among many European ultranationalists, especially in France and in Italy, where the far-right Fronte Nazionale expressed its support for Putin’s ‘courageous position against the powerful gay lobby’ (as well as anti-EU and pro-Assad stances) through dozens of posters in Rome. On a more prosaic note, European right-wing extremists seem to benefit financially from their co-operation with the Kremlin. While no direct evidence exists that the Kremlin provides financial support to its extremist allies in the EU, it would be ridiculous to suggest that they are not paid for their lobbying services – and the extreme right are indeed engaged in lobbying Russia’s interests in the EU. Putin’s Russia is a far-right political system characterised by authoritarianism, nationalism and populism – all these characteristics are intrinsic to the European extreme right, so co-operation between them seems like a natural process. Obviously, there are differences between the European extreme right parties – they differ in their radicalism and positions on particular issues. The Front National may be willing to co-operate with the Partij voor de Vrijheid or FPÖ, but not with Jobbik or Ataka. Even in one national context, far-right parties may be unfriendly to each other, so, for example, it is hard to imagine any fruitful co-operation between Italy’s Fiamma Tricolore and Forza Nuova. However, Putin’s far-right government is eager to co-operate with any European ultranationalist party unless it is critical of Russia for historical or other reasons. Thus, the ideological affinity between Putin’s regime and European extreme right parties is one reason for their co-operation. Second, as the ideological approach of the majority of the European ‘observers’ at the Crimean ‘referendum’ demonstrated, right-wing extremists are the main pool of EU-based politicians who can legitimise Russian actions domestically and internationally. When reporting on the work of the international ‘observers’, the Russian state media never mentioned their ideological positions. On the contrary, they were presented in a boringly neutral way: FPÖ’s Johann Gudenus was simply ‘an MP from Austria’, Front National’s Aymeric Chauprade – ‘a political scientist’, neo-Nazi Enrique Ravello – ‘an observer from Catalunya’, etc. These trivial representations were needed to reassure the Russian audience that the Crimean ‘referendum’ was perfectly legitimate. The European Parliament said it was not? Well, there were members of EU-based parties, among them MEPs, who concluded that it was. Internationally, too, extreme-right politicians were always most supportive of Putin’s actions. Who praised Putin’s Russia – after ‘observing’ the unfair parliamentary elections in Russia in 2011 – for having ‘a robust, transparent and properly democratic system?’ Nick Griffin, MEP and leader of the extreme-right British National Party. In this sense, the European right are a magic talking mirror from Brothers Grimm’s Snow White, always ready to confirm the fairness of the Evil Queen. 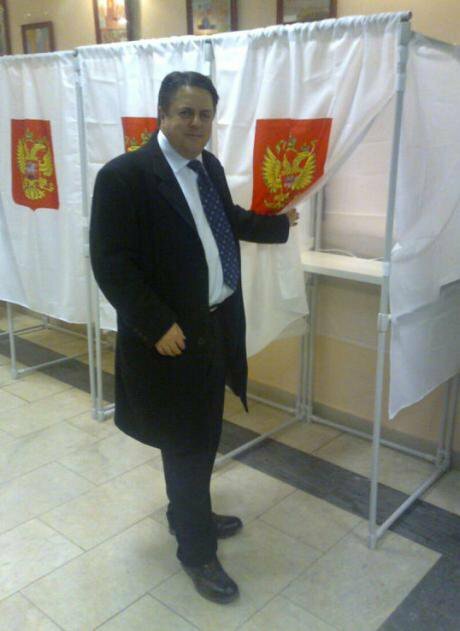 Nick Griffin, leader of the British National Party, as an observer at the 2011 parliamentary elections in Russia. In 2013-2014, European right-wing extremists were the most vocal in defending the Russian interference in and, later, invasion of Ukraine. They did not even have to convince the international audience fully of the legitimacy of the Russian actions; they only needed to contribute to the disruption of the narrative of the overwhelming majority of democratic leaders and major international organisations that condemned Putin’s actions. Third, despite the far-right nature of Putin’s regime, it is only a façade hiding a corrupt, self-serving and elitist system, for which cooperation with the European far right is one of the means of furthering and securing its business interests in the West. In his most recent book (‘System of the Russian Federation in the war of 2014’), Gleb Pavlovsky argues that there are two authorities in Putin’s Russia. One is the actual, visible state that is very weak with deliberately inefficient political and administrative institutions; the other is a parallel state, or what Pavlovsky terms the ‘RF System’. The latter has secured absolute power in Russia, but it cannot operate openly because it is straightforwardly unfair and corrupt. Because of this, the ‘RF System’ needs the weak actual state to hide its activities. As Ivan Krastev wrote, ‘Russia clearly has elections, but no rotation of power. [...] In the Russian system elections are used as the way to legitimise the lack of rotation’. As the Russian parliament is virtually a rubber-stamp assembly (‘the parliament is not a place for discussions‘) for legalising the decisions of the parallel state, so Russian nationalism, social conservatism and populism – for the ‘RF system’ – are just instruments for controlling society by feeding its prejudices and phobias. In the European context, Putin’s Russia uses the extreme right also as tools to undermine and weaken EU political institutions. Stronger EU institutions restrain the Kremlin’s westward corrupting advance in terms of economy, politics and international relations. The strong democratic West is eventually the only obstruction to Putin making Russia the global superpower. Since Russia is unable to win over the West by fair-and-square competition, i.e. by advancing economy, technology, culture, human capital, etc., it can only become the superpower by weakening other actors. Consolidated democracy and good governance, seen as the essential prerequisite for the West’s economic prosperity, are, therefore, one of the first targets for the ‘RF System’. The inherently anti-democratic extreme right (and extreme left) are, thus, natural allies of Putin in his anti-democratic crusade against the EU. Although there is no reason to idealise EU mainstream parties, they are less prone to corruption than the extreme right, or – looking at Germany’s former social democrat chancellor Gerhard Schröder, now the chairman of the board of Nord Stream AG and a top lobbyist for the Kremlin – the extreme right may simply be less expensive to corrupt. As oil and gas revenues account for more than 50% of Russia’s federal budget, the Kremlin needs to secure its position as a major supplier of gas to the EU. The map of South Stream, a planned gas pipeline to transport Russian gas – deliberately avoiding Ukraine – to the EU, shows that every country on the route has either a pro-Russian government or a far-right party represented in parliament and openly pro-Kremlin: Bulgaria (pro-Russian government, Ataka), Serbia (pro-Russian government), Hungary (Jobbik), Austria (FPÖ, BZÖ), Greece (Golden Dawn), Italy (Lega Nord). The only exception is Slovenia where the far-right Slovenska Nacionalna Stranka is insignificant, and the current political establishment is democratic and pro-EU. Given the cooperation between the Kremlin and the European extreme right, it is no wonder that, for example, Jobbik prefers the South Stream pipeline to Nabucco, another planned gas pipeline aimed at reducing the EU’s dependence on Russian energy. The Kremlin needs continuously to attach and re-attach Western countries by permeating their economies with Russian (clean or dirty) money, in order to reach the point where Russia, as a business partner of the West, would be ‘too big to fail.’ In this situation, the democratic consensus of the West – in the face of Putin’s anti-democratic crusade – would be shattered by pragmatic considerations. This is why the corruptible, Eurosceptic and anti-democratic nature of the extreme-right parties is more important to the Kremlin than their racism and ultra-conservatism. Today, the far right (and the far left) seem to be the most convenient partners for Putin. The European elections in May will make clear how far Putin will have advanced towards his goal of corrupting and weakening the EU.